We are creating a New Visual Culture. We are the future. We are the creators of a new visual culture. We are the future. 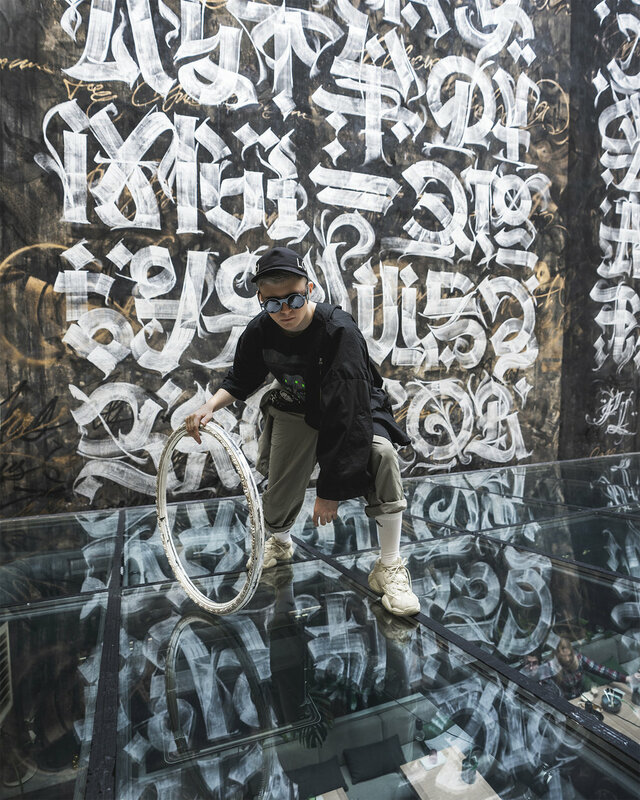 The mural «Д ¥ Ā Л И З М» (Dualism) has appeared on the inner wall of the WYNWOOD design hotel at the very heart of St. Petersburg. The artist’s lecture will take a place there on August 2, 2018. Collaboration between POKRAS LAMPAS and the WYNWOOD design hotel is not accidental. Modern musicians and artists from all over the world stay here, fashionable St. Petersburg citizens go for breakfasts or brunches. The main sights of the city, clubs and bars, museums are just nearby. WYNWOOD hotel is located at the very heart of the city and is literally surrounded by the art. Lampas’s work «Д ¥ Ā Л И З М» is a Manifesto, dedicated to the duality of the perception of contemporary art. 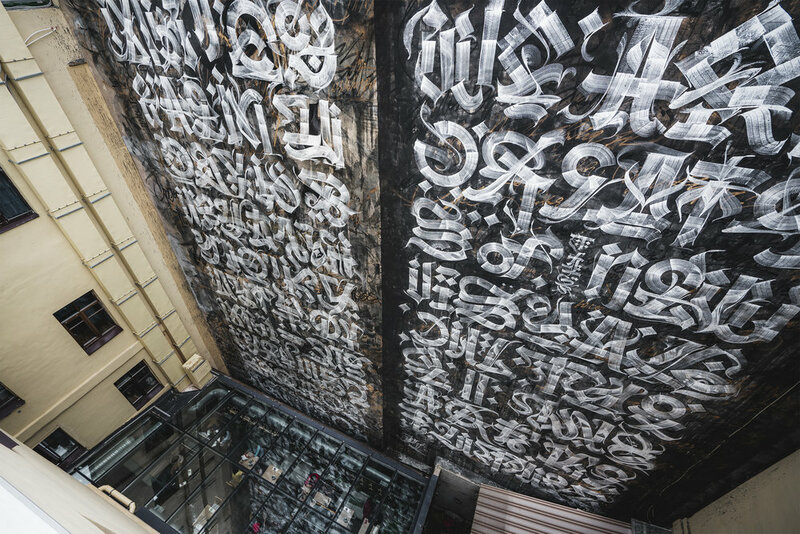 Its text in two languages, helping the viewer to explore both differences between alphabets and cultural references in the forms of letters, and combining them into the context of calligraphy of the future. Dualism also reflects in the choice of color: the left part of the work is closer to the original range of the facade, while the right part is more contrast. Together they form the complete picture. 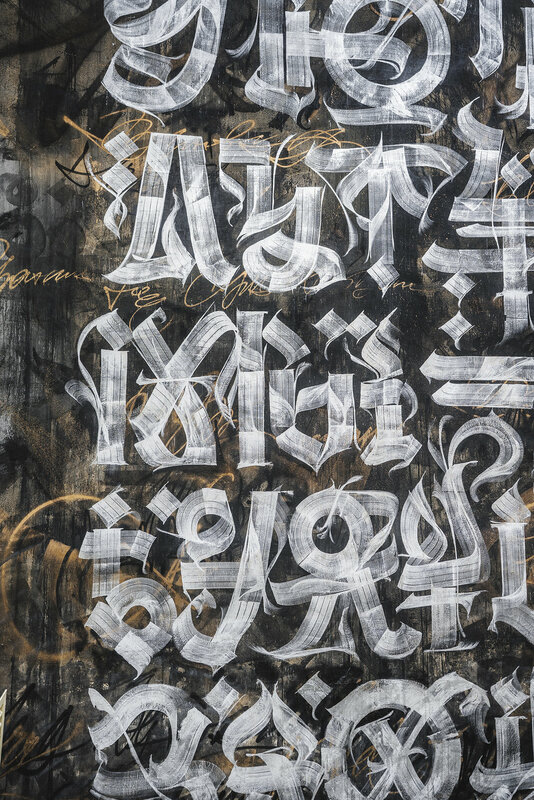 The text itself is a Manifesto of Millennials with the values of past generations, made by borrowing the forms of letters from western and eastern, ancient and modern calligraphy. «Д ¥ Ā Л И З М» is the largest mural by Pokras Lampas in St.Petersburg — it covers an area of more than 250 square meters.